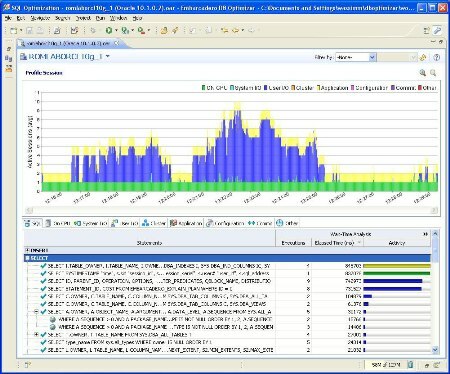 DB Optimizer from Embarcadero Technologies Inc. works in conjunction with your SQL code to enable quick discovery, diagnosis and elimination of performance bottlenecks. By focusing on specific SQL statements through query statistics, DB Optimizer can discover and evaluate problematic statements. DB Optimizer is designed to work with all existing database tools to prevent performance-related outages and help organizations maintain maximum database uptime. Graphical visualization of wait-time analysis to easily pinpoint the SQL statement causing poor database performance. Hyperlinked drill-downs to locate detailed activity information for an individual SQL statement. Real-time quick fixes to automatically flag and correct inefficient SQL functions. System requirements: Microsoft Windows 2003, Red Hat Enterprise Linux 5.0, SUSE Linux Enterprise Server 10 or higher. Sun Java 2 Standard Edition 5.0 Update 11 for Microsoft Windows or Linux; Sun Java 2 Standard Edition 5.0 Update 11 for Linux x86. Memory: 1024 MB; disk space: 500 MB.